I know I’ve played this one before, but it’s been a long time. I’d forgotten how beautiful it is. The tune takes the singer on a beautiful journey, from dark to light, from low to high. You could call this the “Prodigal Son” hymn. It basically tells his story from start to finish from the point of view of a parent or friend beaconing him to return. If I was writing a hymn and wanted to learn how to tell a story with melody alone, I’d take a close look at this hymn. Notice how the composer extends the story by pausing on notes that are not in the 1 chord. Whenever you pause on the 2nd, 4th, 6th or 7th scale degrees, it keeps the tension alive and the story moving forward. Too much landing on the 1st, 3rd and 5th scale degrees gets boring and stunts the progress of the story. The harmony is very warm and soothing. Being in A-flat major adds to the warmth. I’ve always felt it to be a purplish, velvety color with all those D-flats and A-flats. The challenge with this hymn is the very large vocal register required to sing the melody. It stretches nearly 2 full octaves. From a low A-flat below the staff all the way up to an F on the top line of the staff. That’s WAY too big for a congregation. This hymn sounds more like a Motet to me than a hymn. Or a least on the borderline between the allowable stretches in a hymn and the beginning of a choral motet. This is probably why it’s almost never programmed in Sacrament meeting. At least not in wards that I’ve been in. I think it would make a lovely musical number for the choir to sing. It’s the kind of piece I’d want them to sing directly out of the book, a cappella, and with lots of dynamic contrast to keep the verses and the story interesting. But I wouldn’t have the sopranos sing until the “Harmony” marking in bar 14. For the first 13 bars, I’d have the altos and the upper half of the tenors sing the melody with a couple additions. Then I’d have the bottom half of the tenors sing the top note in the bass clef and all the basses sing the lowest note. So, A-T1-T2-B. See my markings below. At bar 14, I’d open it up to a regular SATB voicing. I really love that suspension in the tenor voice on the word “folly” in bar 15. It’s a 7-6 suspension within a 5 chord in 2nd inversion. With the stepping bass before it, this makes a gorgeous sound. As the tune continues to ascend up to the D-flat, then the E-flat, then finally the high F, it takes several detours between these pillars. Very beautiful writing. I’d only add one little bit of motion in the alto at the “and mock” spot towards the end. It adds a little extra color into the texture. I wonder what the committee will do with a hymn like this. As far as quality is concerned, it should stay in the hymnal and be sung more often. But where practicality is concerned, I’m afraid it might be on the “cut” list. But if they return the “choir” section to the hymnal, which I think is a nice idea, this hymn would fit nicely there. That’s all for today. Have a great day! P.S. In the spirit of Thanksgiving week, I want to tell you all how grateful I am for you, for your comments on these posts, and for your interest in raising the bar in Latter-day Saint Church music. I really hope you’re finding these posts useful and helpful. If so, please don’t hesitate to spread the word. You can tell your friends to click the big green button below to subscribe. Thanks! Here we have another hymn that I love! I love the text of this hymn by one of the greatest hymn writers in history (he wrote over 6500 hymns!). The original text has seven stanzas, and some interesting editing occurred to come to the four verses that are in our hymnal, though I think the message remains for this text. Karen Davidson provides a wonderful, succinct, summation of this text. She cites that “Charles Wesley here addressed one of the great paradoxes of human nature: when joy, peace of mind, and eternal reward are the result of righteousness, why do so many men and women scorn these blessings? The righteous who enjoy such happiness can only be puzzled and dismayed by the ‘simple souls who stray.’” I love the invitation in the final verses for those who stray to return and join in seeking the ways of righteousness. I think this is one of the great tunes in our tradition. It is difficult to sing, as the range is very large, but the melody has great beauty. I find the harmonization in the first half of the hymn only using three voices also to be very inspiring and interesting, and especially effective with the low range of the melody. I think this tune is very well matched with the hymn text. The suggested tempo for this hymn is a very good one. I find myself playing it right in the middle at 84 beats per minute. This is a great hymn to practice soloing out the melody, as for the first part, you have one note for your right, the tenor note in your left, and the bass note in the pedal. 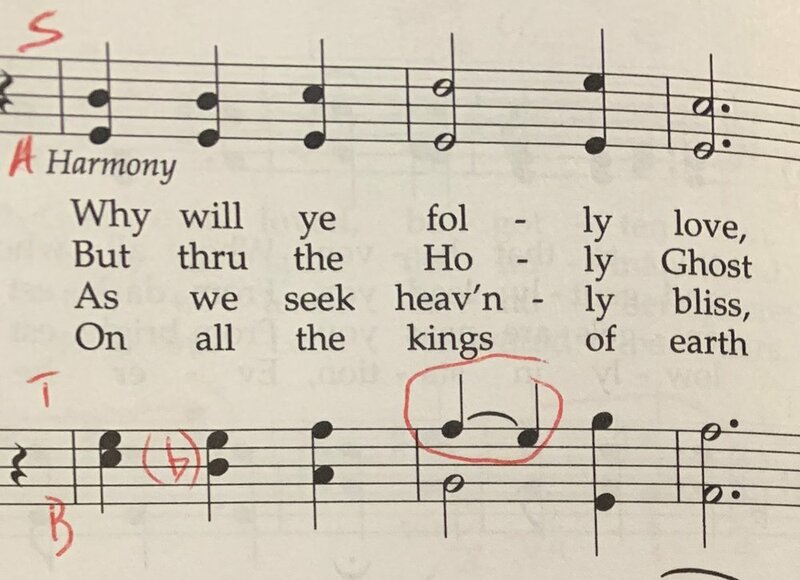 This would be an excellent place to solo the melody on a nice solo registration and then return to a chorus registration playing on the great for the second half of the hymn. Swell: Hautbois 8’, Flute 8’; Flute 8’, 2’; Flute 8’, 4’, Nazard 2 ⅔’; Cornet (Flute or Principal 8’, Flute or Principal 4’, Nazard 2 ⅔’, Flute 2’, Tierce 1 ⅗’); Flute 8’, 4’, Larigot 1 ⅓’; Bassoon 16’, Bourdon 16’ (played up the octave); use of the tremulant could be nice with some of these registrations such as the Flute 8’, 4’, Nazard 2 ⅔’ or Hautbois 8’, Flute 8’ IF the tremulant is mild and not too fast or wide in pitch. If it adds gentle undulation, then I might experiment with it, as it might add just the right touch. I would most definitely NOT use it if the tremulant is fast and/or too wide in pitch. One must be very cautious and judicious with its use, and only in this application (soloing out a voice). I would never use it in normal hymn accompanying (all hands on one manual).